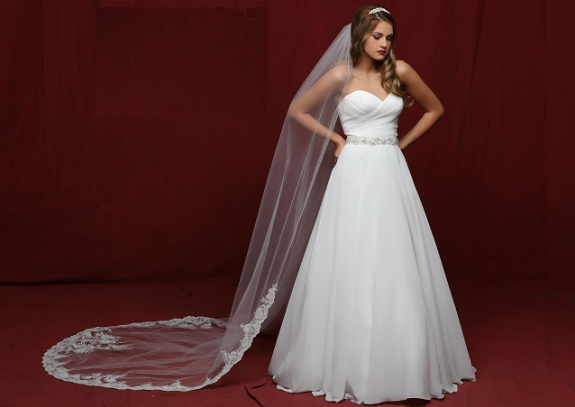 A Cathedral length wedding veil will add elegance and grandeur to your wedding day. Designed for your dramatic walk down the aisle, the cathedral length veil is a stunning 108" long. We have over 200 styles of cathedral veils for you to choose from for your wedding! We are excited to have selections from Elegance by Carbonneau, LC Bridal, Mariell, JL Johnson Bridal, Ansonia Bridal, Elena Designs, FC Bridal, enVogue and Symphony Bridal. Shop our extensive array of cathedral length veils for just the right style for your wedding day! Featured here is the exquisite 6839VL partial lace edge cathedral length veil by Symphony Bridal. All of our bridal veils include a metal comb for easy placement in your hairstyle.